Garbage Pail Kids, the irreverent '80s icon is back for more outrageous fun with an all-new 2nd Series hitting stores nationwide this week. To find it, all you have to do is just follow your nose! In addition to the likes of "Justin Timberleg," the bat-eating "Scuzzy Ozzy" and the snot slinging super hero "Spider Manny," the all-new series includes certain stickers with a Scratch & Stink feature. Experience the "scent-sation" of "Passed Gas," "Puke" and "Rotten Feet" and other foul odors reeking in every box of Garbage Pail Kids. "Believe me, these stickers really do stink ... and that's a good thing," offers Ira Friedman, Topps VP/Publishing. Last fall, when Topps introduced the first new series in 15 years, not only did the "20 and 30-something" crowd come out in droves, but legions of youngsters -- ages 7-12 joined the grossly hilarious experience. 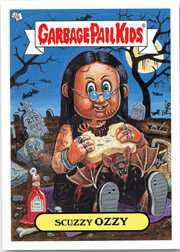 The retro-launch celebration of the Garbage Pail Kids featured original unpublished artwork, the debut of an official website and required four printings to satisfy demand. "It's rare when a product transcends a specific age group, spanning multiple generations. And GPK does just that," added Friedman. Featuring all-new artwork, each 6-sticker pack of Garbage Pail Kids Series 2 includes one gold foil sticker and carries a $.99 cents SRP.